This month’s challenge is a family recipe from Jen of Use Real Butter. 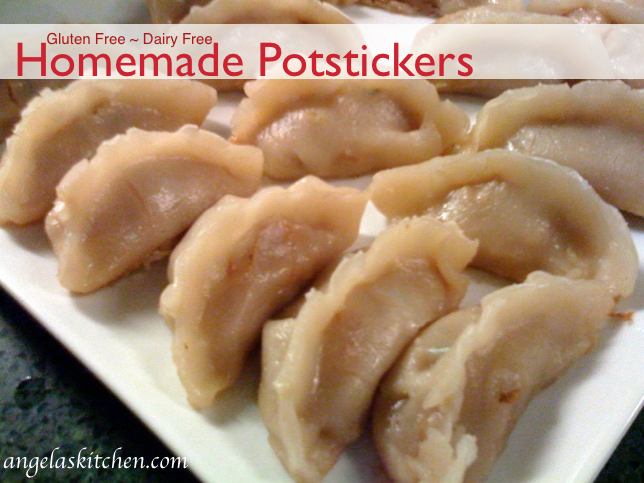 It is one of the things I used to LOVE back in the ol’gluten filled days – potstickers! 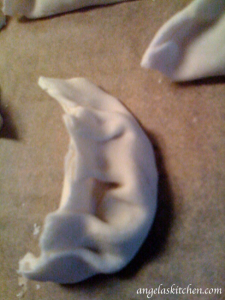 I made a dough last year for mu shu wraps that at the time I thought I would try as a potsticker wrap, but, you know how it goes, I got busy and never quite got to it. So, here we are, a year later, and it took the amazing Daring Cooks to get me to remember and try it. Thanks guys! I am so glad I did. The fillings used were very tasty. Jen is one lucky girl having grown up on these every weekend! This does take a bit of time to put together (think roll, fill, fold and pinch – over and over and over and over…), but I think the results are worth it. I have missed these. I am putting these up in the freezer for Mommy treats (okay, I’ll share…) and for guests and just to have on hand. I will put the freezing instructions and some other filling options on the blog Friday for Gluten Free-zer Friday, so stay tuned! 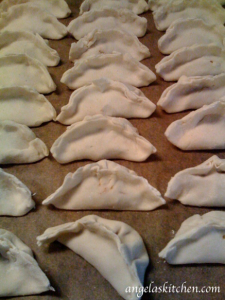 Made a few more than 2 dozen… You will need to double this to have enough dough for the filling. Roll slightly smaller than walnut sized pieces of dough, flatten into a disk, place on lightly “floured” (use tapioca flour/starch) plastic wrap, roll out dough with a rolling pin, rotating dough/flipping dough over so that wrap is evenly rolled out, using plastic wrap if needed to help pick up dough. I made 3 1/2 – 4” rounds. Look how thin this rolls out even though it is a gluten free! Woo! Thank you, Jen, for this challenge. It has inspired me and brought back an old friend to my dinning table! 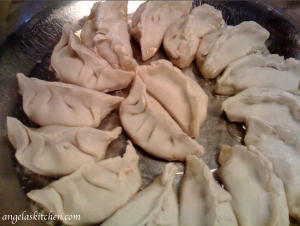 I will be making, and freezing these with various fillings to enjoy whenever the mood strikes… Knowing myself, that mood should be very often! Glad to see the gluten-free wrappers in action. Despite being fragile, they appear to have held up well. Excellent job on the pleating, too! Your postickers look fantastic! I am totally impressed with the fine pleating you did using a GF dough recipe. Way to go! That looks like an awesome adaptation. I'll have to link to some of these great alternatives. Thank you! Ditto what everyone said! The gf potsickers you made are perfect!